Songza, a Chicago-based music startup, will soon launch to offer a new way to search, play and share music online. This free music search offers an extremely minimalist and slick interface to create and play playlists online. Songza's interface was designed by Chicago-based Humanized. Songza is so fresh, they have not even officially launched yet but if you are in the Chicago-land area this week you might want to attend the official Songza launch party on Thurday night. Songza is a music search engine so it seems appropriate that it presents you with a simple search box which kicks off the music discovery process. Upon returning results actions are presented in an interesting box shape as shown to the left which is just one example of how the Songza page transforms as you interact with it. 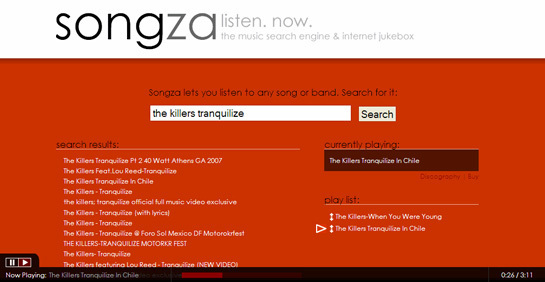 I search for "The Killers" and I was pleased to see that their latest single, "Tranquilize" was available via Songza. I created a playlist of songs and played them on the page. Songza is similar to JiwaMusic and SeeqPod but unlike these other playlist sites, if I decided to navigate away from Songza I lose the tracks I was listening to. However, I assume that with time Songza will offer additional capabilities to make managing my playlists easier and save them. Songza is still perfecting cross-browser compatibility as it only works in Firefox at the moment but I could see myself using Songza to search for full music tracks of new songs and listening them fully before I purchase them. I could also see myself setting up a playlist of songs to listen to while working on the computer.